Surely January is a winter month but Vietnam is a typically tropical country so perhaps its weather in winter is not as cold and harsh as in western countries? Coming to Halong in January, you will experience the beauty of this amazing place in the middle of winter. The average temperature is 17 C degree with the highest temperature and lowest temperature of 20 C degree and 14 C degrees, respectively, so it is still rather cold during this time of the year. It is highly recommended that you bring along a sweater, jacket, and comfortable shoes. In terms of rainfall, this is actually one of driest months of the year with monthly rainfall of 18mm. There are about 3 hours of sunshine per day. The average sea temperature is 21 C degree. Swimming in Halong Bay during winter months in general and in January, in particular, is not recommended for local people who are used to the tropical climate. However, the average sea temperature in winter is actually not too cold to swim (especially in the afternoon) for foreign tourists who come from countries with a temperature of below C degree in winter. Swimming is considered a good activity for you to stay in shape during winter. Do not dive in the water immediately. Warm-up activities can help you minimize any shock effect caused by the cold sea temperature. Do not go over your limit: Your body will get accustomed to the cold but do not spend too much time in the cold water. When you start feeling numb in your toes and fingers, take it as a sign to come out of the water right away. Keep yourself warm and dry immediately after you get out avoiding shivering, which can lead to a cold. However, do not try to increase your body temperature too fast with hot water: it can do more harm and good. A dry tower and warm clothes are much better options. 3. What else can you do in this month of the year? Swimming is not for everyone, especially those who hesitate because of cold water, but the poetic scenery of Halong in January is definitely great for taking photos. Also, because it is really dry with very infrequent rain, tourists can take part in various outdoor adventures. Take note that such activities like kayaking or mountain climbing may be suddenly cancelled in case of very heavy fog. You may wonder if Halong is still worth visiting even when it is surrounded by fog. In fact, it is the mystical fog that makes Halong more hauntingly beautiful and romantic. There is a great sense of peace during winter months you cannot find in any another month of the year. Sitting on the deck of a cruise, watching islets appear and disappear in front of you in the thin veil of fog is like visiting a magical place. When the weather gets too cold to stay outside, you can relax in the cabin equipped with a heating system. Travelling by seaplane can also bring a very memorable experience but remember to take into account limited visibility and high cost. 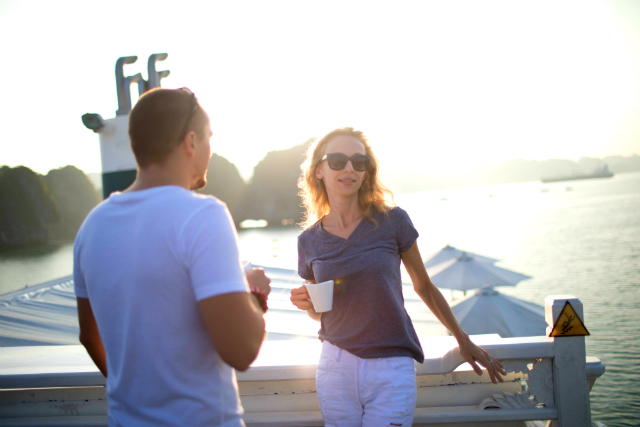 Winter is the peak travel season in Halong Bay with the influx of foreign visitors to the bay can be a quiet crowd. Depending on the lunar calendar, the Vietnamese New Year (or Tet) often takes place in late January or early February, during which Vietnamese people often go back to their hometown and spend time with their family. Visiting Halong in January may mean some cruise lines stop operation or your favourite restaurants may close down for holiday. On the other hand, you will see how local people prepare for Tet. In addition to the famous cuisine of Halong Bay in winter, you can also sample different traditional dishes (like “banh chung”). You are planning a visit to Halong Bay in February. You don’t know if it is a good time to be in Halong Bay. 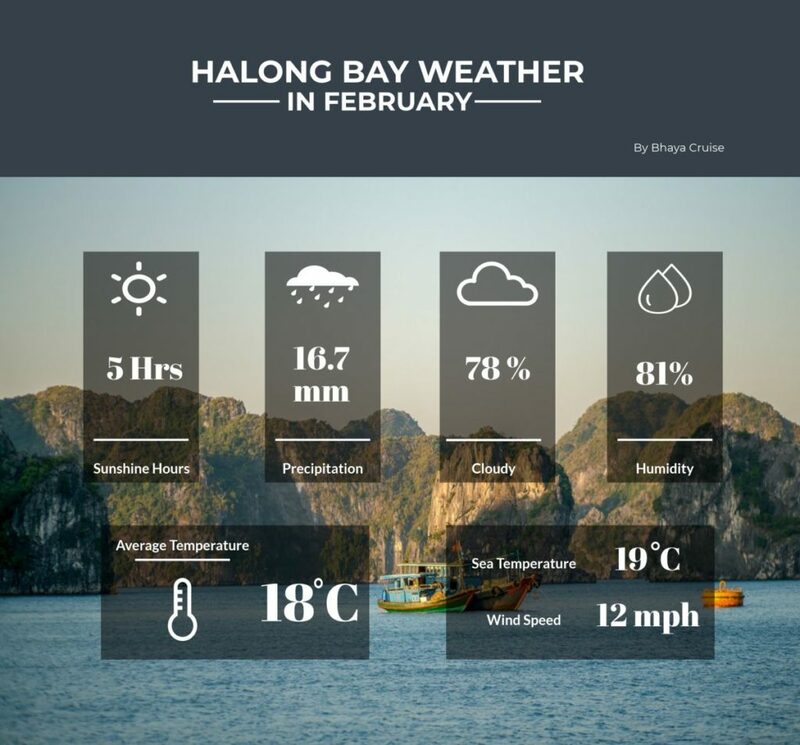 Keep reading for our detailed weather forecast of Halong Bay in February as well as travel tips. February is late winter and early spring in Vietnam in general, so the weather is getting warmer. In the daylight, it is very comfortable with light sunshine. During the night, temperature decreases making it a bit colder. The average temperature is around 180C which is quite pleasant for tourist from the area with the temperate climate. The highest temperature can reach 210C during the sunny day while at night it can fall to around 120C. It gets warmer toward the end of the month. 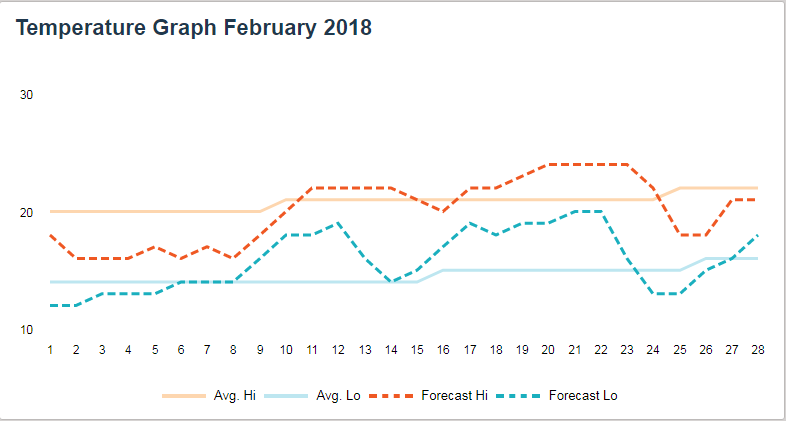 You can expect to have 5 hours per day when the sunshine over the bay in February. The sunlight is not as harsh as in the summer but soft and very comfortable. The kind of weather is favourable for many outdoor activities. Check out the other best months to visit. However, there is a high chance of being cloudy which is 78%. The average sea temperature is 19.30C which is not too cold if you want to swim. The average rainfall in February for the country is 22mm, Halong Bay usually witnesses less rain. The figure is around 16.7 mm falling over an average of 10 days in the month. The average humidity is 81% during the month. This is not the most humid month in Halong Bay. In fact, it doesn’t affect your outdoor activities, and you will feel better when you are out on the bay. In the day it can be warm but the temperature drops during the night. Remember to bring a light jacket. It is still in high season so make sure to have all your hotels, cruise and transportation booked in advance. The cruise rate can be higher during this period so with early booking you are likely to get a discount or at least a better price. Seafood is famous for its freshness and high quality in Halong. Seafood hotpot is a good option for dinner. In addition, squid cake is the most well-known speciality of Halong. You should not miss the chance to taste some when in Halong. 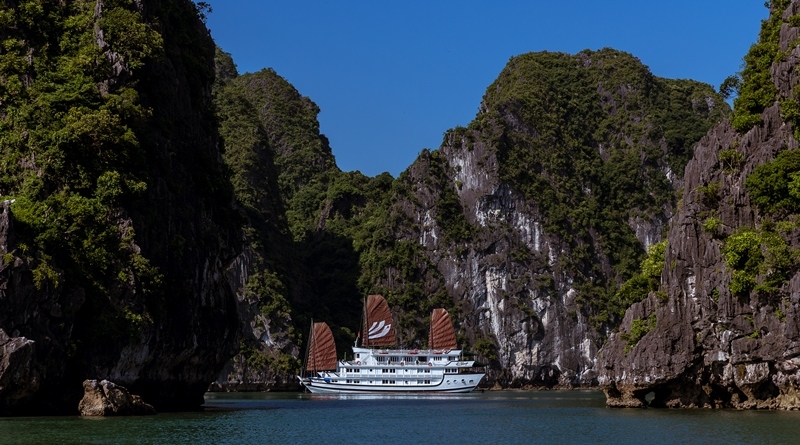 The best way to discover Halong bay is cruising. 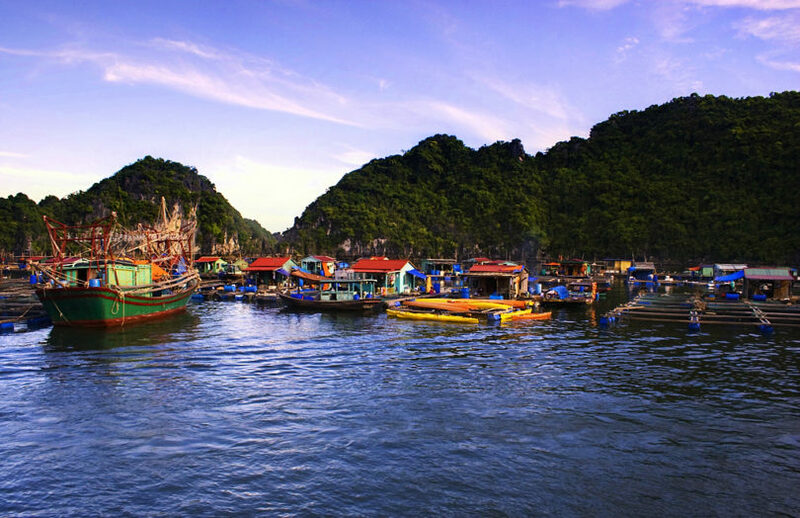 There are special “Tet Cruise” which is designed to bring you quintessence of Vietnam. 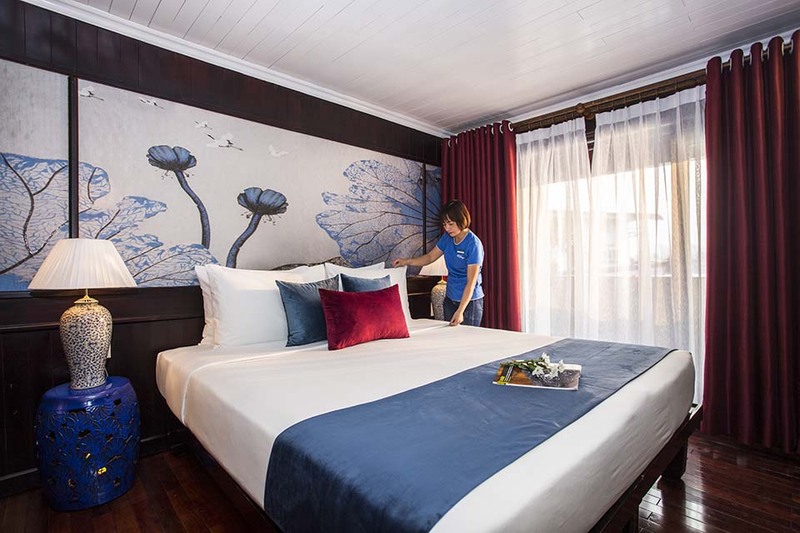 You will get to live in the Vietnamese festive spirit. 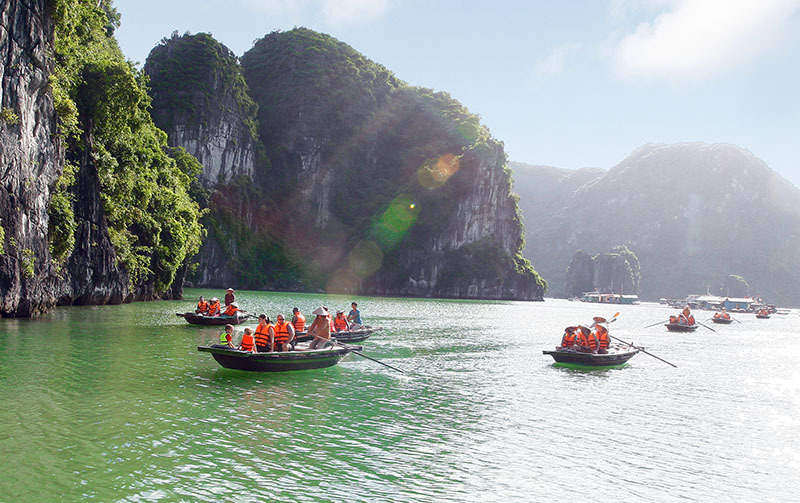 There are numerous Halong Bay tours are operated during this special season for you to decide. February is a crucial time in Vietnam. It is the time for Tet Holiday or Lunar New Year – the biggest celebration of Vietnamese people. This year, Lunar New Year comes by 15th of February 2018. Every street and house is decorated with flower and cherry blossom to welcome the New Year. You will have the chance to experience a Vietnamese traditional New Year which is much different from what you have back home. 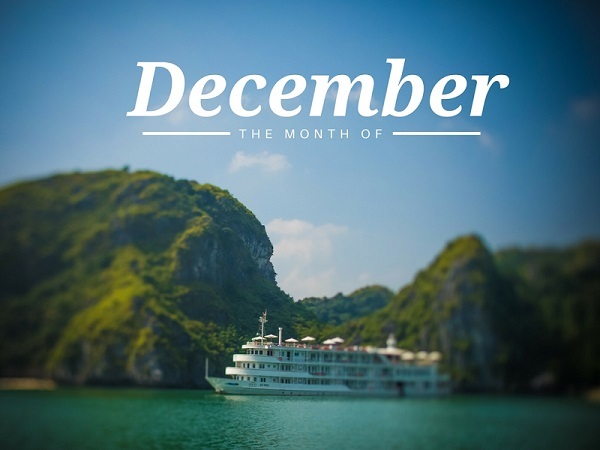 Halong Bay weather in December, is it worth visiting? Winter starts from December, but weather is generally mild, with average low and high temperatures of 13 °C (55 °F) and 20°C (68 °F) for Halong Bay, and damp with occasional showers. Halong bay weather in June – What will the weather be like ? 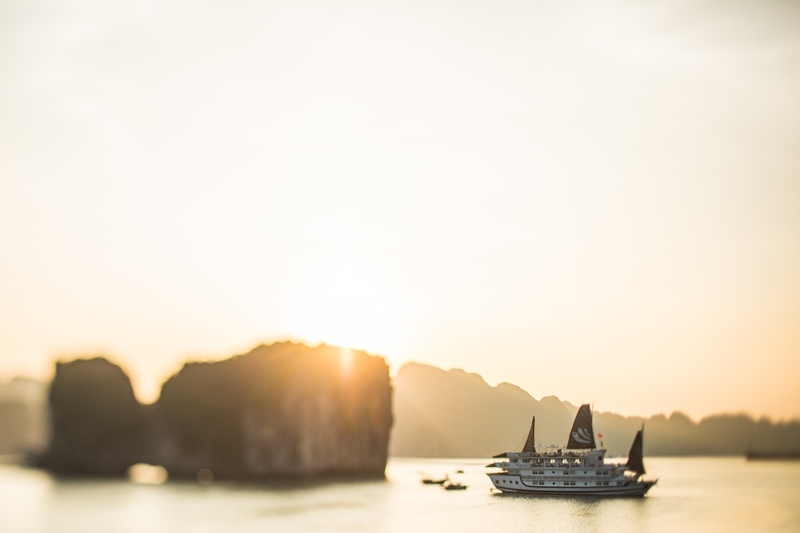 Summer has truly arrived here in Halong Bay. June witness the highest temperature throughout the year with an average of 29oC. The weather is much more pleasant on the bay. Halong Bay weather in June is perfect for you to enjoy the beach and swimming. The Sunshine will stay for 8 hours a day and water temperature is around 27oC which allow you to stay active in the water comfortably for the extended period. The following cute infographic is a basic weather index for Halong Bay in June. You also can check out more about Halong Bay Weather of other months. You will see Halong bay at her finest under the sun which allows a clear view of the bay with emerald water, magnificent karst tower, and crystal clear blue sky. 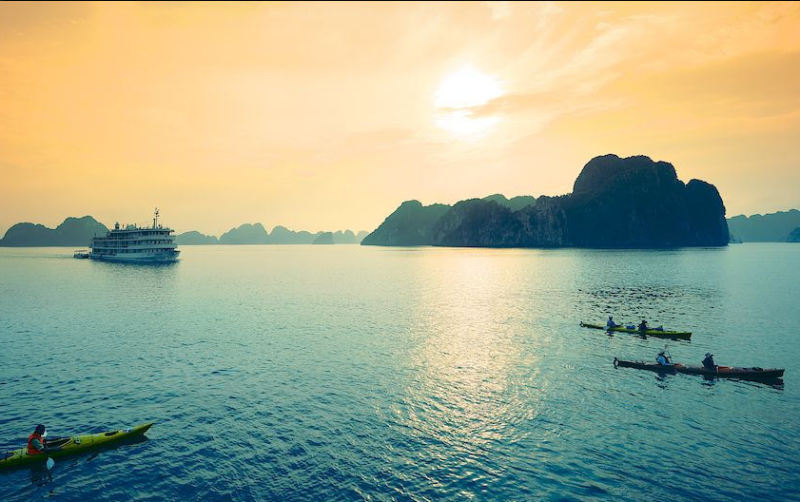 8 hours of sunshine give you more time to explore Halong bay and therefore a less tight schedule. All ships must arrive sleeping point before it’s dark. It is not safe to cruise when the sun is out. 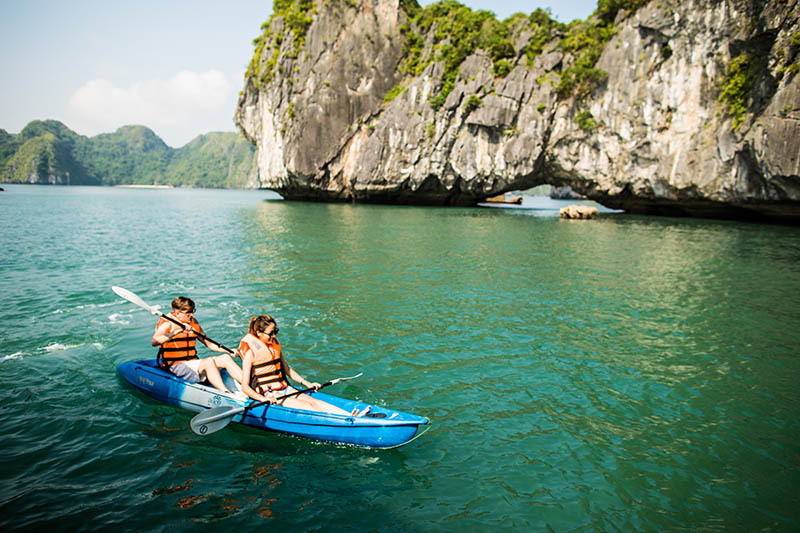 Summer is suitable for various outdoor activities which are a big plus for your Halong bay cruise. The average temperature of seawater is 27oC, perfect for swimming and kayaking. 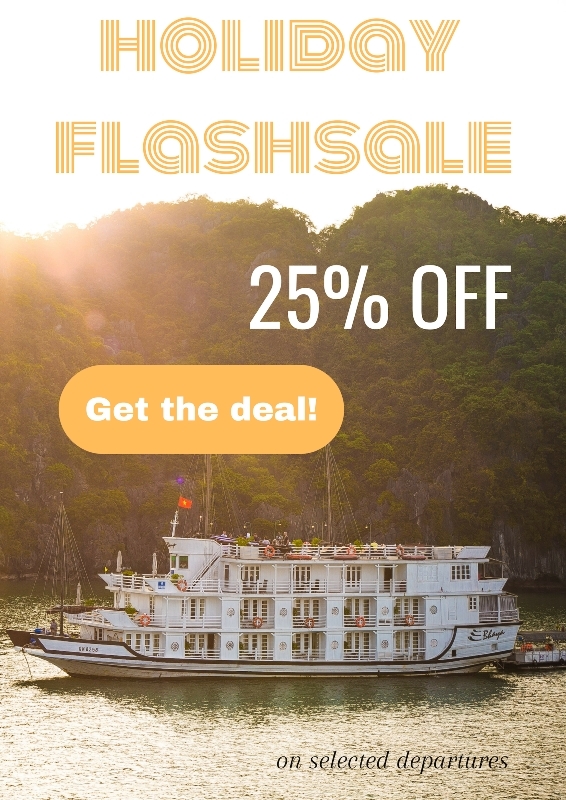 Another point that makes June is a good time to travel Halong is deal and promotion. In fact, this time is low season for tourism so many cruise operators offer deals and discounts. Check out Bhaya Cruises’ special deals for 2 days 1-night Cruises & 3 days 2 nights Cruises! June is good but not the best time to visit Halong due to some unexpected storm. So be prepared and take some handy tips! Halong bay weather in June is pleasant and full of sunshine. Make sure you enjoy it to the fullest. Be careful with jellyfish. Most of the jellyfish in Halong is harmless except fire jellyfish. Even though the chance you encounter one is very rare, you should be ready. Take proper treatment can ease the pain. Follow instruction from your tour guide when kayaking. Don’t go into any cave without guidance. Water current changes in an unpredictable way which prevents you from getting out or worst, capsize your kayak and throw you back into. 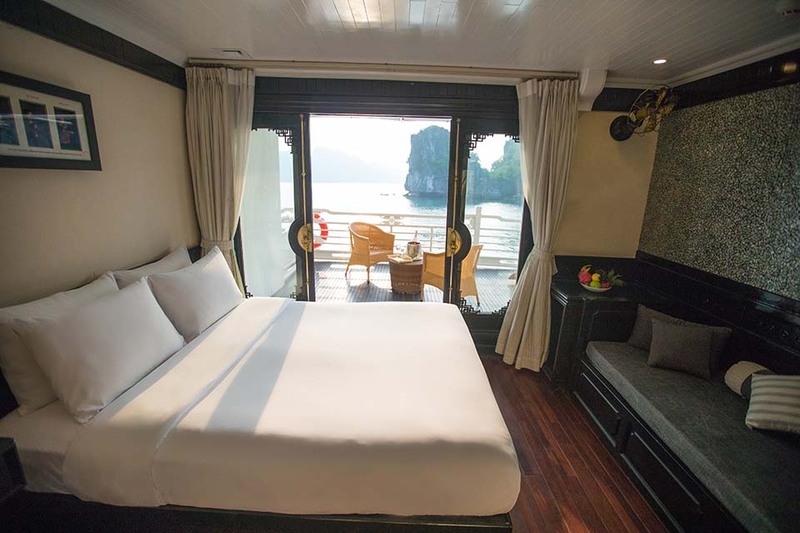 The best months to visit Halong Bay are from October to December but what if you only have free for travel in September and are worried about whether the weather is favorable? 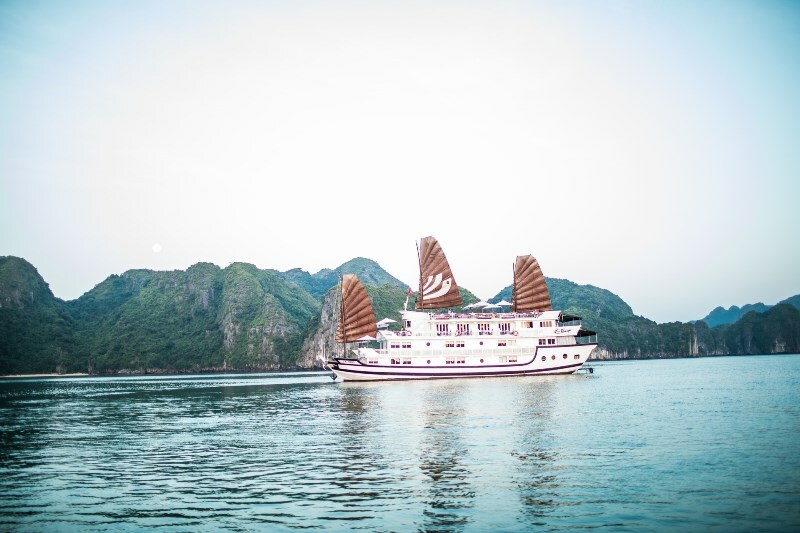 What makes October the perfect weather to visit Halong Bay? Halong Bay is very hot from April to September but cools from October to March. It is difficult to define what the best month is to visit this natural wonder because this totally depends on the preference of each visitor. For example, many avoid rainy months for fear of frequent downpours and tour cancellation due to bad weather but others love the quiet atmosphere of this low season. No matter what season you prefer, October is no doubt one of the best months for visitors thanks to its amicable weather which is, overall, neither too hot or too cold. Generally, September is still very hot but rather wet (though not as blazingly hot as summer months) while November brings along chilly winds and crowds of visitors. October stays in the middle as you can still feel the warmth of summer but without lots of daily downpours. The average temperature during October is 25 C degree with the highest of around 28 C degree and the lowest of 21 C degree at night. As a result, this cool weather is ideal for those who feel uncomfortable with the summer’s heat in Vietnam. Since this month is not really prone to heavy rains, the risk of tour cancellation is low compared to the previous 3 months. Near the end of the month, there can be some chilly days but you still do not need to pack heavy sweaters with you; just light summer clothing and a light jacket will be enough. In case you spend a lot of time outside, bring some sunscreen with you. There are about 6 hours of nice sunshine each day and the average humidity level is 72%, which are quite the same as in September. It rains about 11 days this month but also does not each long each time. If you love swimming, October is a great time to do so with the average sea temperature of about 27 C degree. It is totally fine to swim for hours without worrying that it is too hot outside. From November, it starts to get cold for swimming. Swimming in the calm, emerald green water will be a very refreshing experience for you so do not miss it. Let your body flow on the water, feel the smooth-white sand and watch the golden sunshine above to chase away your worries of daily life. With moderate temperature and light, cool breezes, visitors can take part in various outdoor activities without worrying about sweating too much. 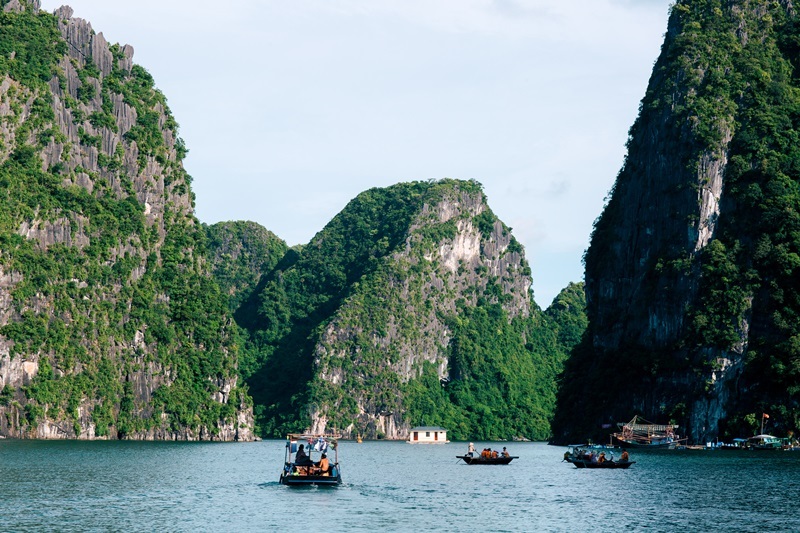 Now that the chances of frequent downpour ease remarkably, visitors can freely explore each and every corner of islands, caves, and grottoes in Halong Bay. Try riding around the island on a rented bike to see the daily life of local people and watch over the island from different angles along the way. For adventurous visitors, activities like hiking and kayaking are the right fit for you. One small tip when it comes to kayaking: do not worry that this is for the professionals only. In fact, this activity is designed for everyone and even amateurs can quickly grasp the basics after about 30 minutes. The amicable weather of October is ideal for booking a cruise to explore the island. Better yet, the romantic light breeze at night will accompany you when you witness sunset and sunrise on the cruiser’s deck. It is wonderful to watch the water turn from emerald to grey-blue and then to crimson with the last rays of the sun, signalling the night come. At that instant, suddenly the bay becomes one color only before being coated in the moon’s silver light. Sunrise brings about hopes of a new beginning with a brand new day. It is such an amazing experience that you should not miss! October signals the end of the low season in Halong Bay. Even though the number of local visitors is not high, there is an increasing influx of international visitors. However, the place is still quite peaceful. Even though you may not get large discounts or promotion programs like in July to September, services are good when there are not too many customers to serve. Last but not least, it is the stunning scenery of Halong Bay in autumn. Just take a boat or cruise trip around the bay during the autumn day and find yourself get lost in the thin vase of mist and the light sea breeze. Halong is truly heavenly during autumn and the view from a seaplane can leave you breathless. 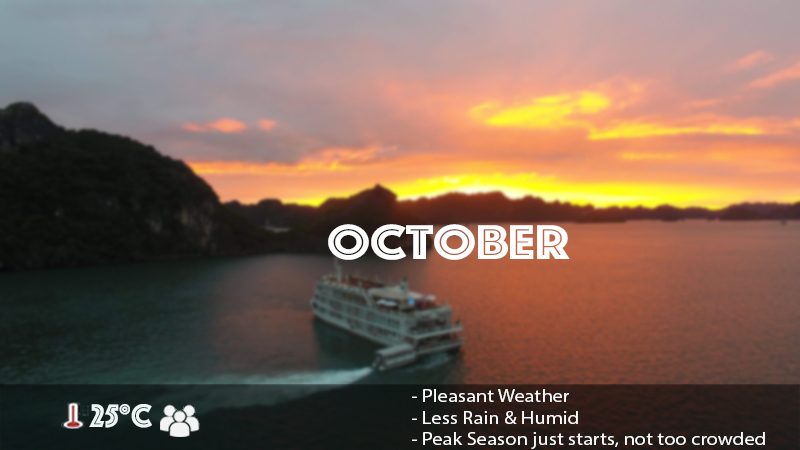 October is not in the peak travel season to Halong but it offers the most pleasant weather of the year for visitors. So if you have some free time this month and still wonder if it is a good time for traveling, do not hesitate anymore: just pack your bag and let Halong welcome you with its charm. 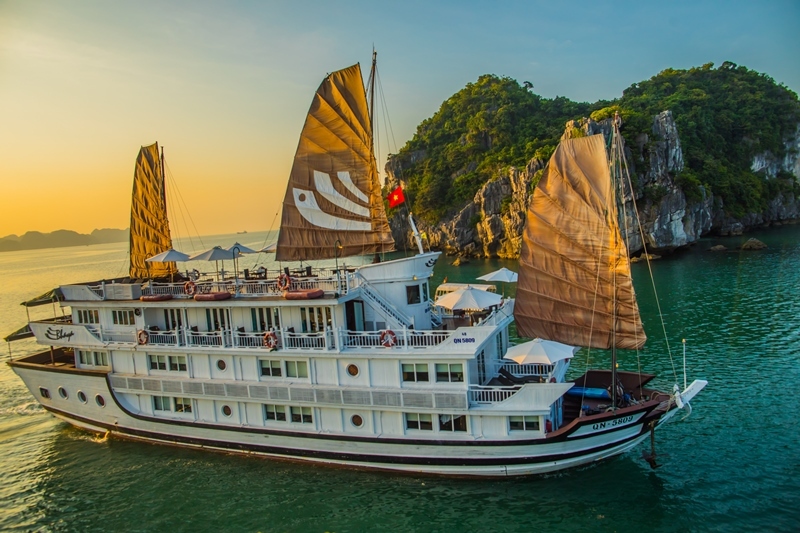 Take a look at what Halong Bay overnight cruise offers from Bhaya Cruise for your October Trip!